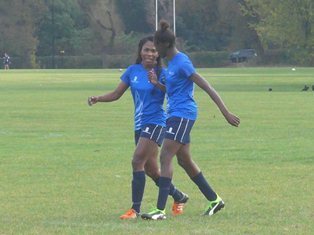 The prolific Nigerian striker Rinsola Babajide scored fourteen goals in UEL Womens Football Team’s 40-0 demolition of UEL in a Cup clash at Hackney Marshes on Wednesday. The England youth international took to social media to celebrate her achievement and also praised her teammates for their efforts in the big win. “40-0 win in a cup game vs UCL - scored 14 goals & a few assists ð���ð��¾ next round here we come , well done girls @UELWFC1 ð���ð���ð��¾ð��� , ” Babajide posted on Twitter. UEL Womens Football Team led 14-0 heading into the interval, with Teesh netting seven times while Leah, Ellie, Katie, Daisy and Alex also registered their names on the scorecard. Crystal Palace product Babajide, who can play as a winger and striker, joined Millwall Lionesses in January 2015.